Without a doubt the most tasty subject in our portfolio… the Chateau Unang wines ! Thanks to the wonderful photos by Indra Van Regemorter there was a solid base to create the atmosphere for this website. Initially it started of as a photoshoot to promote a tasting event at the Chateau. While making the photo-shoot we had the occasion to taste the wonderful wines and the equally delicious cheeses, a very recommendable experience. 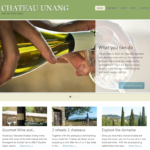 It did not take long for the plan to arise to create a new website for Chateau Unang and here is the result. After the initial phase the website will be extended with multiple languages and will be the base of regular News updates from this very special Chateau.